Ordinarily, I am not a very compassionate mother when it comes to missing school. My boys know the rules are the same ones my Mom used to judge whether or not my sister and I would get on the bus. At the risk of TMI, if they aren’t vomiting, don’t have a fever or diarrhea, off to school they go regardless of any unseen ailment they claim is plaguing them. Last Monday and Tuesday I was struck down with probably the worst headache of my life. You know the kind where it hurts just to blink. I couldn’t stand for more than 10 minutes without fearing collapse. I wanted all the lights off and curtains closed. Thankfully that was before my husband left on his latest “business trip” and he was able to take care of me and the boys that evening. The next day was marginally better, but of course in this crazy winter weather we are having this year, school was cancelled once again here in Louisiana, so I was home alone, feeling sick and still having to care for my two young children. I’m sure just about all of you reading this have been there, and thankfully I am not ending my story on this pitiful note. Friday morning when my otherwise perfectly healthy 8 year old complained of a headache, I relented my usually harsh rules on attendance. Had I not suffered earlier in the week, I probably would have drug him out of bed, forced him to dress and eat and sent him on his way. There would likely have been a lot of drama and perhaps even some screaming on both out parts. Because of the pain I had endured, I was able to instead show him compassion. I could have turned bitter and told him to suffer through it like I had, but instead, by the grace of God, I chose compassion. Instead of damaging our relationship with harsh words and anger, I was able to strengthen our bond with love. Our pain and suffering here on earth can lead is in two directions, compassion or bitterness. By enduring our own hardships, we can either become more sympathetic toward the suffering of others and inclined to give them aid and support as we show them mercy, or we can harden our hearts and be inclined toward animosity with others because of it. One is an act of love and the other a display of hostility. In one of the most famous stories in the bible, we receive a lesson in compassion. Samaritans of Jesus’s day were the people who lived in what had once been Israel’s Northern Kingdom. They were essentially cousins of the Jews, but since they failed to keep Jewish law in its entirety, there was much hatred between the two. Yet, it is the Samaritan Jesus chooses to highlight in the well-known story Luke relates in his gospel account. In Luke 10:25-37, Jesus is bantering with a lawyer who attempts to justify what I assume are his own failings at keeping the requirement to love your neighbor as yourself, when he asks Jesus for clarification on the point of just who qualifies as his neighbor. Jesus’ parable tells of a Jewish man who is attacked on the road by robbers and left for dead. Two men most Jews would expect to stop and give this poor man aid, a priest and a Levite, passed right by, as if they hadn’t even seen him. Perhaps these two men hadn’t suffered in their lives, or maybe they had never known what it was like to need help. Either way their inaction was far less than loving and if another man hadn’t come along, would have led to the injured man’s demise. Then, came a Samaritan man, whose people were so despised by the Jews that they wouldn’t even pass through their land. A man who had likely been rejected and persecuted all of his life by the Jews, a man who had most certainly known need and rejection in his life. This man is the one most Jews would have expected to spit on the bleeding victim and keep on walking. Yet this is the man who bent down and cleaned the Jewish man’s wounds, placed him on his own donkey, took to an inn and then paid for his stay while he recuperated. The Samaritan man had cultivated a heart of compassion. I believe that whatever we endure in this life is used by God to enable you to be compassionate and loving toward others. Perhaps not as directly or as instantaneously as in my experience this week, but you will likely find a connection. This life certainly provides us with plenty of experiences that can make us more sympathetic toward others: unexpected death, illness, injury, pain, loss of a job, depression, divorce. Being an Army wife inherently adds a whole host of additional opportunities to develop compassion: deployments, frequent moves, separation from loved ones, injuries, PTSD. I could go on and I’m sure you could add your own to the list as well. We don’t get to choose what our experiences are, but we definitely make the choice about how we use them to relate to others who face similar situations. If we do not allow our harshest experiences to give way to compassion, the tears, suffering and pain will have been for nothing and will likely lead to bitterness. We steal God’s glory by refuse to let our sad circumstances lead us to love others. Are you cultivating compassion or breeding bitterness. 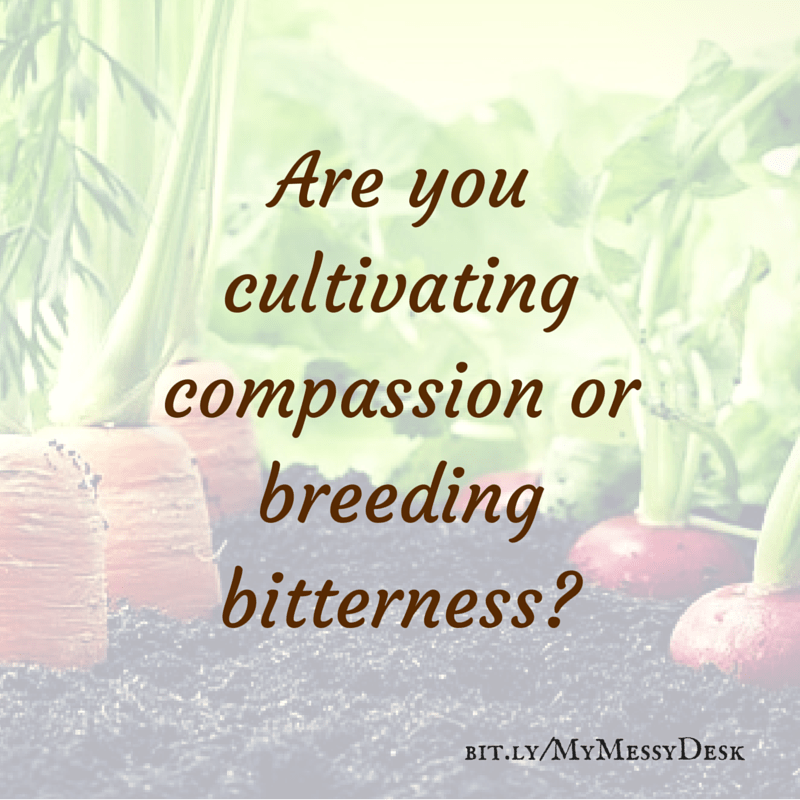 Leave a comment – I’d love to read about how you might cultivate compassion today! This was just what I needed today. Thanks for taking time out of our busy day to share.